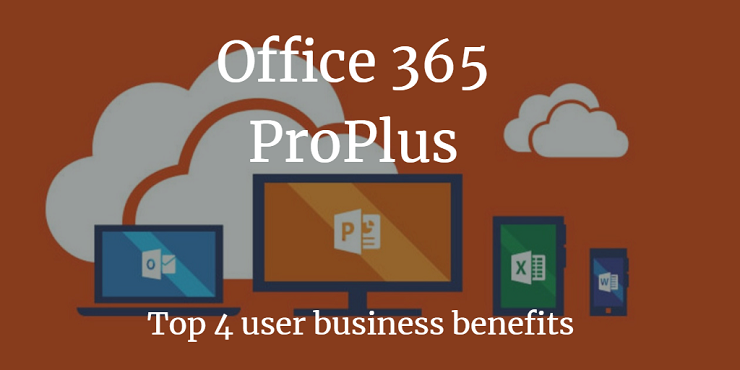 Still confused about Microsoft Office 365 ProPlus and how it works? The team at Xello speak with many customers making the switch from the traditional MSI version of Office (perpetual licensing) to the cloud-based Office 365 (subscription) and understand that many misconceptions about M365’s capabilities arise during the transition, especially for those moving from on-prem solutions for the first time. Our experts have taken the time to debunk the top 10 misconceptions about Office 365 to help your organisation better understand its differences to standalone Office 2016 or Office 2019, clear up the confusion and properly highlight the many unique benefits it brings as an essential cloud-based, productivity software suite. Facts: Office 365 ProPlus is Office 2019 and much more. Office 365 Pro Plus has all of Office 2019’s current feature-set in addition to regular, cumulative updates that make it the most up-to-date version of Office available for enterprises right now. If your business has a Microsoft Office 365 subscription, you most likely already have usable licenses for Office 365 ProPlus, making the purchase of a standalone perpetual license for Office 2019 redundant. Don’t be fooled by Office 2019's date of release; Office 365 ProPlus and other business/enterprise tiers of Office 365 are always the latest and most feature-rich versions of Office, with the latest quality and security patches, too. In fact, Office 2019 was released with features available in Office 365 ProPlus for years, thanks to its subscription-based model which allows Microsoft to deliver those upgrades automatically and refine them based on feedback. If you want to future proof your productivity software suite, ProPlus is the primary Office 365 option to assess. Facts: Office 365 ProPlus and other Office 365 business and enterprise subscription plans allow businesses to pay for per user, per month, and are far more cost-effective in the long-run than the old, traditional one-time purchase for lifetime software (which is also called and known as perpetual licensing). It’s important to consider by paying for Office on a subscription basis, your organisation gets access to the most up-to-date cumulative updates that improve your software and adds all-new features. Standalone Office 2019 is a one-off payment, and while its license does not expire, its features will inevitably become outdated and you will still need to pay for the next release. You’re also getting more bang for your buck with Office 365 ProPlus, as you get 5 licenses per user to assign to work PCs or Macs, and 5 more licenses for work phones and tablets. In comparison, standalone Office only grants 1 license for assignment to 1 device. A Forrester Consulting study also determined Office 365 delivers a return on investment (ROI) of 321% and pays for itself within two months for composite mid-sized organisations, with around $74,000 in savings over three years just by eliminating hardware and third-party software. Microsoft 365 Office ultimately helps businesses save money by moving away from ageing on-premises software solutions, which require manual installation and maintenance, to a flexible cloud-based Click-to-Run solution. It enables your IT team to eliminate legacy solutions that are costly and do not meet modern business requirements, and provision the full Office suite to users and save considerably in the realm of labour and infrastructure costs. Facts: Office 365 is a Microsoft service based in the cloud, but that does not mean your organisation has to fully migrate your local infrastructure to the platform to actually start using and leveraging the Office software suite. Office 365 is what’s known as Software as a Service (SaaS), a licensing model where software is centrally hosted in the cloud and delivered to the end-user on a subscription basis via the Internet. Basically, SaaS is any software suite or application that's not housed on-premise. You can combine Office 365 with your on-premise network to adopt a hybrid-cloud model approach; this integrates cloud services with your local infrastructure and acts as a pathway for a future migration when your business is ready to move and has the right cloud strategy. This cloud-only confusion directly leads to the next misconception. Facts: Office 365 ProPlus is completely useable offline and you don’t need a Internet connection to use its applications after downloading and installing the software suite on your licensed device. The only online-related requirement to use Office 365 is to occasionally verify your license by connecting to the Internet once every 30 days, otherwise the subscription is changed to reduced functionality mode. Once everything is verified, all features are unlocked as normal again. This common misconception stems from confusion about Office Online, which is a completely separate service from Office 365. Office Online is basically the limited version of Office that allows users to access certain apps (Excel, PowerPoint, Word) through Web browsers, on desktop computer, laptop, smartphones or tablets. Office Online is ultimately meant to be a compliment to your installed Office 365 suite in the rare occasion you need it, such as when you’re on-the-go and you’re using personal devices without Office 365 ProPlus apps downloaded, to quickly view, edit and share documents through your browsers at your convenience. Facts: Many enterprises around the world have made the move to Office 365 and use its cloud storage services without any data compliance or privacy issues - for the simple fact that Microsoft is very transparent about where your data is stored when using its services. Microsoft are incredibly serious about meeting the needs of customers who operate in highly regulated industries, adhering to international data protection laws, and enforcing stringent security requirements for their data centres - which also guarantee 99.9% service up-time. If you store any data using Office 365 cloud services such as OneDrive for Business, it will be stored by default it in the same geographic region as your billing address, and replicated in another region for data durability in case of an unlikely Azure data centre disaster. At the end of the day, your business controls and own any data you store and share (which is encrypted both at rest and in transit) using Office 365. Microsoft do not have access to it and don’t use it for anything outside of processing and storage to help you run your business. In 2019, many businesses are making the move to Office 365 ProPlus and leveraging its cloud-based benefits to the fullest. Organisations of many types and sizes can now collaborate on projects, email with ease, work from anywhere and share assets faster with regular updates and feature upgrades, while eliminating past complexity surrounding Office software licensing. It’s important to keep on top of the facts and educate your organisation on the capabilities and benefits of Office 365 to ensure it is properly and fairly assessed - and understood - when driving your digital transformation initiatives. Learn the differences between Office 365 ProPlus vs. Office 2019 in our detailed comparison guide.